The e-tron Sportback, pictured as a concept, will go into production in 2019. FRANKFURT -- Audi is taking deposits from potential customers for its new e-tron full-electric SUV in four European markets. The e-tron SUV is the first model in Audi's electric car product offensive as the automaker seeks to restore its technology credentials badly dented by its involvement in parent Volkswagen Group's diesel-rigging scandal. It will launch later this year as a rival to cars such as the Tesla Model X and Jaguar I-Pace. Audi has already received 5,000 orders in Norway, Europe's largest EV market, where potential buyers can reserve the car for 20,000 Kronor (2,000 euros), an Audi spokeswoman said. Audi dealers in Switzerland, Austria and Belgium, where the e-tron will be built, also are accepting reservations. Audi's local sales organizations in other markets, such as Germany and China will decide separately when to start taking orders, the spokeswoman said. The e-tron will have a range of 500km (311 miles) and fast charging. Its drivetrain will have a maximum output of 496 hp and generate as much as 800 Newton meters of torque. This performance allows the vehicle to accelerate from 0 to 100 kph (62 mph) in 4.6 seconds. Top speed will be 210 kph (130 mph). Its 4880mm length positions the SUV between the Q5 and Q7 and its roofline is lower than both those models. 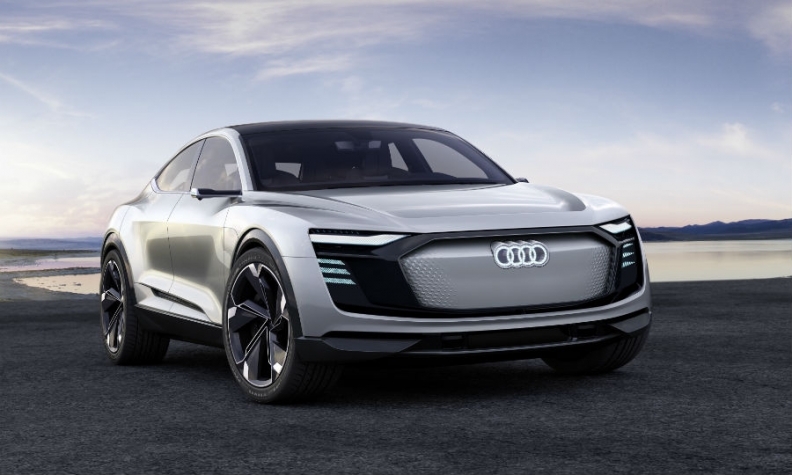 The e-tron SUV is the first of three full-electric cars Audi will launch by 2020. It will be unveiled in Brussels at the end of August in an event Audi calls a summit, CEO Rupert Stadler told reporters earlier this month. The automaker held a similar unveiling for its latest A8 sedan in Barcelona last July. The second EV, which will be called the e-tron Sportback, will launch next year. The car will be a fastback model sitting lower than an SUV but with a more elevated driving position than a standard hatchback. Both of the cars are based on Audi's MLB platform and will be built at the automaker's factory in Brussels. The third EV will be compact model built on VW Group's new MEB electric cars platform. It will launch in 2020, shortly after VW brand's MEB-based I.D. compact hatchback. No production location has been announced. Audi plans to launch 20 electrified models by 2025, of which more than 10 will be full-electric models. Starting in 2021, Audi will add EVs built on a new premium electric platform it is developing with Porsche. Last November Audi said it will build two full-electric cars at its main plant in Ingolstadt, Germany. Stadler has also said the company will build electric vehicles at its plants across the world, including sites in Mexico and Hungary.